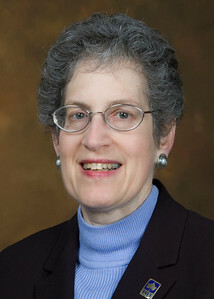 Indiana State University graduate nursing professor Betsy Frank has received the 2010 Midwest Nursing Research Society Nursing Education Advancement of Science Award for her commitment to promote nursing education and nursing education research. Frank, a past winner of the ISU President's Medal and the Faculty Distinguished Service and Caleb Mills Teaching awards, teaches baccalaureate and master's level nursing courses at ISU both online and on campus. This recent honor recognizes Frank and her sustained contributions as a Nursing Education Research Section member of the Midwest Nursing Research Society. In order to be considered for the award, Frank was required to hold a Ph.D., demonstrate an interest in mentoring other nurse educators and be actively involved in research and publication of nursing education. Frank will present a scholarly presentation of an aspect of her current work at the Nursing Education Research Section meeting on April 9 in Kansas City, Mo. ISU Nursing Professor Betsy Frank has earned the 2010 Midwest Nursing Research Society Nursing Education Advancement of Science Award for her commitment to promote nursing education and nursing education research.